60 years hence, National Capital Region is work in progress. This article was originally published in Swarjya on 7th August 2017. Very commonly termed as NCR, National Capital Region is one of a kind in the world. It not only has largest spatial extent but also brings together under one planning jurisdiction covering the entire National Capital Territory of Delhi, thirteen districts of State of Haryana, seven districts of Uttar Pradesh and two districts of Rajasthan. After partition, Delhi witnessed a decadal growth rate of about 50% in its population of migrants. Delhi is considered a hub of jobs and opportunities that led to the inflow of people from adjacent areas. Recent survey has proved that Delhi is the home to one-fourth of jobs created in 8 big cities (i.e. Bangalore, Hyderabad, Ahmedabad, Mumbai, Kolkata, Chennai, Pune and Delhi). Occupied spaces in Karol Bagh, Civil Line and Connaught Place. 1942 vs 1956. Rapid immigration led to the shortage of housing and basic infrastructure accompanied by deteriorating physical environment. As a result, the first step to the planned development of Delhi was taken in 1956 through Town Planning Organization (TPO) which prepared an Interim General Plan for Greater Delhi. The plan suggested that ‘serious consideration should be given for a planned decentralization to outer areas and even outside the Delhi region.’ This indicates that National Capital Region is not a new entity. In the early 1970s, it was defined in geographic terms encompassing an area of over 30,000 sq. km. divided into inner core, middle tier and outer ring. This covered Faridabad, Gurgaon, Ghaziabad, Noida, Panipat, Alwar, Meerut and Rohtak. In this process of planning a spatial development of both the rural hinterland and urban infrastructure, Government of India in concurrence with the states of Haryana, Uttar Pradesh and Rajasthan passed an Act of Parliament in 1985. This Act brought into being the NCR Planning Board. In 1989, this board brought into force the Regional Plan of 2001 – a blueprint of various initiatives and policy imperatives needed to decrease the pressure of migration on Delhi. It identified Regional Centres or ‘Priority Towns’ in the NCR where the population will be deflected to. The planning exercise has been continuously decentralized to Sub – Regional levels (Uttar Pradesh – 1992, Rajasthan – 1994) and Functional levels (Transport, Power, Telecommunication). In 2005, the Board also notified Regional Plan – 2021 which is currently in force. Regional Plan of 2021 attempts to outline future options in tackling the problems of this imbalance in the pattern of growth of Delhi and its surrounding Region in the light of new economic realities post 1991. The concept of the RP-2021 is to develop the entire NCR as a region of global excellence by promoting economic growth and balanced development. We have seen that various areas witness a spurt in the growth after getting included in the NCR. Being a part of NCR, districts get qualified for financial assistance in the shape of soft loans and grants. It also props up the real sector. For example, Jind and Karnal districts of Haryana was included in the NCR in the year 2015. These districts will now be linked with the proposed Regional Rapid Transit System, a high-speed mass transportation rail network facilitating faster movement of traffic among the regional centres. To boost the growth, the board provides loans to the state governments for water supply, sewerage, sanitation, drainage, solid waste management, roads and flyovers, transmission, distribution and generation of electricity at an interest rate of 7.5%. However, the population in Delhi has continued to grow at a pace faster than anticipated. It is estimated that by 2021 the population of the city is the national capital city would be 204 lakhs, and 163.5 lakhs, 49.38 lakhs & 203.5 lakhs respectively for subregions of Haryana, Rajasthan and Uttar Pradesh. 50% of the total area of NCT has been urbanized and by 2021 no rural space will be left. Here are three steps that may help solve the crisis. First, jurisdictions in Delhi and other states have to figure out common priorities. Priorities of States are not in consonance with the Delhi’s development policies which has hindered development. Once becoming a part of NCR, states are bound by the regional plan prepared by the NCPRB. This leaves very little room for the state government to use its discretion. Second, we need enough housing initiatives to control unplanned settlements. The public sector is failing to deliver the requisite housing units in terms of number or cost, and, therefore, the housing problem is accentuating. Slums and squatter settlements are increasing. The private sector should make the best use of affordable housing scheme – Pradhan Mantri Awaaz Yojana – by the government. Also, as recommended by B. K. Sundar Ray, states can either purchase existing EWS plots and flats available for immediate occupancy or invest in fresh developments of such facilities. Third, core regional infrastructure like road, rail, telecommunication and power network should be developed ab-initio, so that the private sector continues feeling enthusiastic about investing in industries, wholesale trade, commerce, social infrastructure etc. We are witnessing a remarkable increase in the entry of private real estate developers, but to sustain a planned growth, urban infrastructure and private real estate has to be in sync. 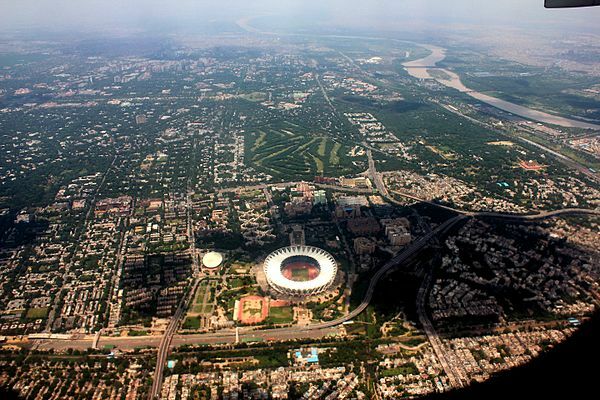 Today, NCR is the largest metropolitan region in India with 34,144 square kilometres. It is also the most populated area. NCR is a unique example of inter-state regional planning and development, bringing together four administratively independent units. It is crucial for the region to develop and keep in mind the objective with which it was established. National Capital Region is a hub of opportunities – for people as well as improvements. We must not let it fail.